Donald Clark Plan B: Serious Games - you cannot be serious man! Serious Games - you cannot be serious man! In a collision of cultures the learning and games world have come together and branded themselves as 'Serious Games'. This all started in 2002 with serious games.org. We now have 'Serious Games' conferences, talk shops and organisations. This is a blunder of serious proportions. The learning world has reached out to the games world precisely because it is NOT serious. This is the worst adjective that could have been chosen. Games solve learning's great conundrum - how do we motivate unmotivated learners. It's not that people can't learn, they simply don't want to. Games work because they produce adrenaline-driven engagement that is powerful, addictive, fun and challenging - not serious. Even the word 'games' is suspect as it is seen as a negative term by many older learners. Sure, games need to be tapped but we can also distill principles from games and apply them in simulations and other learning designs. This is what James Gee has done in his 'What Video Games Have to Teach us about Literacy and Learning'. It's not ALL about pure games. The last time this happened was in the 8os when VR (Virtual Reality) was all the rage. BT and lots of other tecchy carzies were always trying to convince people that this was the future. It turned out to be a sort of Dan Dare past, like rocket-packs, and collapsed as over-funded, technically blinkered academics forced ever more fanciful headsets on to unwilling heads. The games industry swept all of this aside realising that it's what happens inside the head that matters. Suspension of disbelief is just as powerful on a 15" monitor. Thankfully companies like Caspian Learning realise this with their 'ThinkingWorlds' brand. This is more like it - something that focuses on what goes on inside the learners' heads. Check it out. 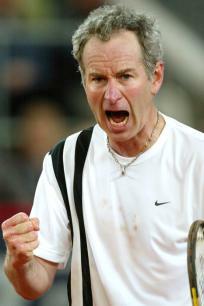 My other favourite McEnroe quote is, "This taught me a lesson, but I'm not quite sure what it is." Very interesting article, especially when games are a rage. I think it is important to understand that games as a strategy is just a kind of solution and not the only solution. Wholly agree, but an underused strategy. Leave it to those "unimaginative Americans" to get this all so wrong. Do they ever get anything right? Fair comment - McEnroe was from US. I'll delete this stupid reference. My intention was to point towqards the failure of over-zealous technical people to think of appropriate brands.